The unique optical system of ESO's Extremely Large Telescope consists of five mirrors, each of which represents its own significant engineering challenge. 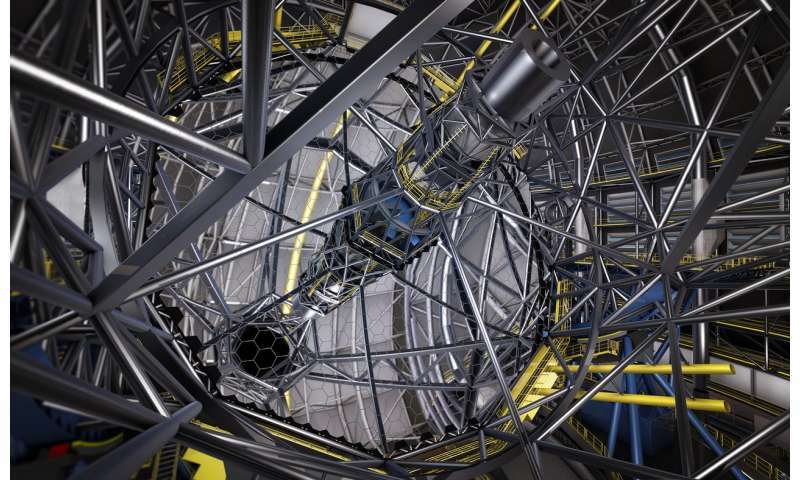 The 39-metre-diameter primary mirror, which will be made up of 798 individual hexagonal segments each measuring 1.4 metres across, will be by far the largest ever made for an optical telescope. Together, the segments will collect tens of millions of times as much light as the human eye. The contracts to manufacture and polish the ELT primary mirror segments were signed today by ESO's Director General, Tim de Zeeuw, and senior representatives of SCHOTT and Safran Reosc, a subsidiary of Safran Electronics & Defense, in the presence of key ESO staff members. The first contract was signed with SCHOTT by Christoph Fark, Executive Vice President Advanced Optics, and Thomas Westerhoff, Director Strategic Marketing Zerodur. The second contract was signed with Safran Reosc by Philippe Rioufreyt, Chief Executive Officer. Tim de Zeeuw expressed his delight at the current progress with the ELT: "This has been an extraordinary two weeks! We saw the casting of the ELT's secondary mirror and then, last Friday, we were privileged to have the President of Chile, Michelle Bachelet, attend the first stone ceremony of the ELT. And now two world-leading European companies are starting work on the telescope's enormous main mirror, perhaps the biggest challenge of all." The 798 hexagonal segments that together comprise the ELT's primary mirror will be produced from the low-expansion ceramic material Zerodur by SCHOTT. Previously SCHOTT was also awarded the contracts for the production of the telescope's giant secondary and tertiary mirrors and the material is also being used for the ELT's deformable quaternary mirror that is currently under construction. Once the mirror blanks are ready they will be passed to Safran Reosc, to design the mounting interfaces, figure and polish the segments, integrate them into their support systems, and perform optical tests before delivery. During the polishing process, each segment will be polished until it has no surface irregularity greater than about 10 nanometres—no higher than a ladybird if each segment were as big as France! To meet the challenge of delivering such a large number of polished segments within seven years, Safran Reosc will build up to a peak production rate of one mirror a day. It will set up a dedicated new facility at its Poitiers plant, specialising in the production of high-tech optical and optronic (electro-optical) equipment. The new contract with Safran Reosc is the second-largest contract for the ELT construction and the third-largest contract ESO has ever signed. Safran Reosc will also design, polish and test the ELT's secondary mirror and tertiary mirror, and is currently manufacturing the 2-mm thick deformable shell mirrors that will comprise the ELT's fourth mirror. Both SCHOTT and Safran Reosc have long and successful involvements with ESO. Together they manufactured many optical components, including the 8.2-metre main mirrors of the four Unit Telescopes of the ESO Very Large Telescope. The ELT is currently under construction at Cerro Armazones near ESO's Paranal Observatory in northern Chile, and is scheduled to see first light in 2024.